Welcome to Put This in Your Brain! We offer fun things to think, make, do, and explore for brains of all ages. Whether you’re interested in poetry, travel, stem projects, DIY and the maker movement, artists and great minds, or even thinking about thinking — we offer something fun to put in every brain. From free posters, printables, and activity sheets, to local educational adventures, we make learning new things free and fun for both adults and kids. 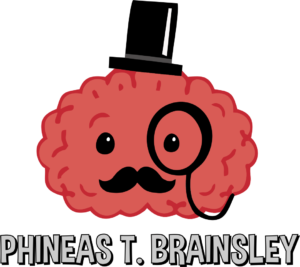 Meet Phineas T. Brainsley, our beloved mascot. He’s a smart, sophisticated gentleman– gentlebrain, and he’s always on the look out for brain-worthy fun. Keep an eye out for his adventures each week, or join our newsletter, Put This in Your Inbox and let Phineas bring the fun to you! We believe that learning is fun, natural, and something that humans are wired to do. Learning happens constantly — it’s a spontaneous and essential part of the human experience. Put This in Your Brain is a fun place to learn interesting things about the world. We strive to feed creativity and imagination, offer the thrill of discovery, and encourage thoughtfulness and rational, objective thinking. We employ a DIY aesthetic and approach. Knowledge is free. We are homeschool, unschool, and traditional classroom friendly. We do not promote a set curriculum or learning style, but are more interested in igniting a spark and encouraging adults and children to find their intrinsic motivation and desire to know more about the world around them. We approach various topics as a guide, offering suggestions and presenting information and activities in fun and interesting ways. If you are interested in partnering with Put This in Your Brain, we’d love to discuss our available sponsorship and advertising opportunities. Contact us to discuss our current rates and see how we can work together.